Metallic finishes continue to be on-trend in interior design. Lustrous and shimmering, they complement both dark and light/white shades to perfection. Shiny metals sit well alongside natural wood for an 'industrial chic' look - or why not try mixing them amongst our SCANDI-STYLE Logs to create a contemporary feature in your empty alcove? A GOLD metallic sheen is applied by hand to one end of each log - the other is left in its natural state. Display whichever end suits your mood! 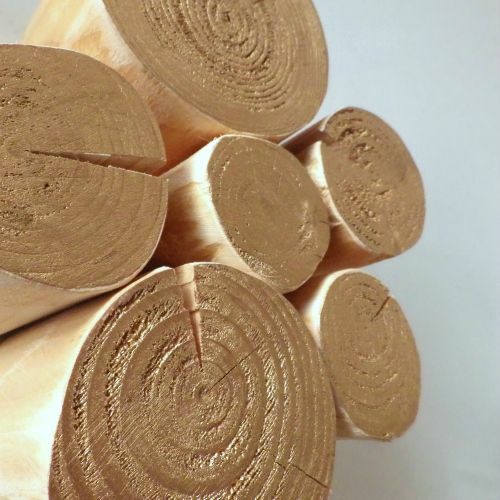 Each bundle contains 12 - 15 GOLD LUSTRE logs including two halves to neaten the edges of your installation. Diameters range from 4cm to 15cm. One bundle will fill an area measuring 30cm x 30cm x log length.